Congratulations to three learners who have excelled in our December 2018 'Learner of the Month'. Since leaving school they have all been working towards learning new skills in their chosen apprenticeship field. They have been gaining essential skills for the workplace. Including time-keeping, attendance, attitude and social skills. All three learners have excelled across the past month and were nominated by PM Training staff, supervisors and tutors. Well done to Chloe Eaton, 17, who recently started work experience at local care provider, Safe Harbor. She has made a fantastic impression. Chloe has been working towards a career in health and social care as part of our Careworks programme and has adapted to any work that has been asked of her. She is outgoing and very hands on. "I didn't think I'd win. I'm really pleased and happy. My placement is going really well, it's mint." Well done to runner-up, Tom Devine, who never fails to show professional behaviour whilst showing respect to all staff and learners. He always shows a great attitude towards work and is a wonderful asset to PM Training. 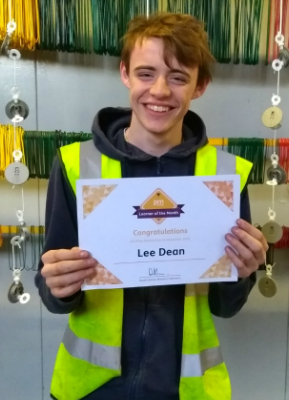 Congratulations to third place, Lee Dean. He always receives excellent feedback, is polite and shows an outstanding attitude towards work. His nomination comes on the back of being proactive about seeking employment. He has recently been offered an apprenticeship at Diamond Metal and is progressing well. Congratulations to all the learners nominated, keep up the great work!